New factions and even more powerful heroes. According to a blog post a few months ago, Total War: Warhammer 3 seems to be in pre-production. The series was conceived as a trilogy, and the third game will surely tick off the remaining factions and complete the grand project. In the miniatures game the old world is dead, replaced by the Age of Sigmar, so in a way the Total War: Warhammer series is a preservation project as much as it is a compelling fantasy grand strategy game. It's probably quite a way off right now as Creative Assembly works on finishing the very promising Total War: Three Kingdoms, but that just gives us space to speculate. Here are a few features we'd love to see in Total War: Warhammer 3. So far we’ve been fighting Archaon and the warriors of Chaos. The occasional greater daemon turns up here and there, but so far we’ve mostly seen beastmen and humans corrupted by the dark gods. I’d love to see the four Chaos gods reflected as independent daemonic armies in their own right. It would be tricky to make them full playable factions, but not impossible. Tzeentch can keep adding new floors to a silver tower. Nurgle players can plant fetid gardens to spawn new infected plaguebearers. A Khornate capital could just be a mountain of skulls that gets larger whenever you defeat an army. Some of Warhammer’s most batshit units are Chaos daemons. Imagine going full heavy metal with an army of Skull Cannons or building an army around the Blue Scribes of Tzeentch, on a mission to learn every spell in existence. Daemons would bring a lot to the campaign map as well. You can imagine building some mechanics around their tendency to corrupt humans and tear open portals to the realms of Chaos. The four Chaos gods themselves have very different personalities, and are in constant competition with each other, which makes them a good fit for a game about factions falling out and going to war for ever and ever. The faction that puts artillery on steam trains has been woefully underrepresented so far. It's time for Chaos Dwarfs to make a comeback as one of the core races in Total War: Warhammer 3. The dwarf legions are awesome, obviously, but you would also get access to bull centaurs—some of the most imposing cavalry warriors in the universe. Total War: Three Kingdoms consolidates a bunch of old policy and agent systems into its heroes. They have a role in diplomacy, trade, city management, and war. Some are great governors, others are great warriors. There are even different classes of hero that reflect different battlefield roles. Much of this design would work perfectly with the heroes of the Warhammer world. 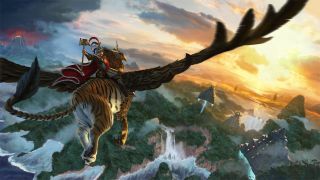 Heroes are already powerful in Total War: Warhammer, but the third game could borrow some of that Three Kingdoms intrigue. Defections and loyalty problems could create interesting dilemmas, particularly if the lure of Chaos plays a bigger part in the sequel. I liked the vortex campaign a lot in Total War: Warhammer 2, but it's time to get serious. The End Times was a massive event that destroyed the old world—literally, the planet exploded. The stakes couldn't be higher, and the End Times brings together all of Warhammer's most important movers and shakers like Karl Franz, Nagash, Teclis, and Tyrion. It's also a good fit for the introduction of the full Chaos range, because the dark truth about the Warhammer world is that Chaos always wins, it's just a matter of time. The End Times also introduces a lot of objectives for each faction, which would suit a new campaign. Total War: Warhammer is on course to become the ultimate digital collector's set for fans of the universe. The first two games, DLC included, have added almost every faction, even the ones the new Age of Sigmar setting have left behind in the tabletop game. It proved a challenge to bring all of the factions together on one massive world map in the Mortal Realms update, but it was worth it. The resulting campaigns are (small c) chaotic, but it's a lot of fun to pick a faction and try to take over the entire world map. The world map will probably have to expand eastwards into the dark lands and the eastern steppes (look out for ogres!) and by Sigmar the turn loading times will be long, but the fantasy is worth it: here's the entire Warhammer world, populated by almost every faction Games Workshop have created, go conquer it. This is a speculative entry, but it covers a couple of aspects of the Warhammer universe and hobby that the otherwise excellent Total War: Warhammer games haven't touched on. I don't expect anything like this to appear in the third game, but hey, speculation is cheap. There are not many opportunities to personalise your army in Total War: Warhammer. Unit livery is fixed, so I can't field the bright purple Wardancers my heart demands. While it's a good decision to make the named heroes of the Warhammer universe faction leaders, I wish I could exert some control over my other generals. They spawn fully formed when I recruit them and I have to look at their dumb faces forever as they order hordes of Treemen to walk into Flamespyre Phoenixes, which Treemen famously love doing as dry flammable wood-beings. As the dire consequences of my generalship unfold, I would at least like to zoom in on my hero's custom hat or something. Anything to distract me from my dryads' dry, crackling screams. What would you like to see Creative Assembly add to the finale?